who was an intensely creative, prolific and often provocative artist whose work was shown in galleries and on the streets of Chicago, his hometown of Madison, Wisconsin, and other places. He ws stolen from his family and friends, the world of art, and the world at large on June 14, 2008 at age 24 near his apartment in Chicago by a vicious act of violence by neighborhood thugs. Click HERE for more information about SOLVE. 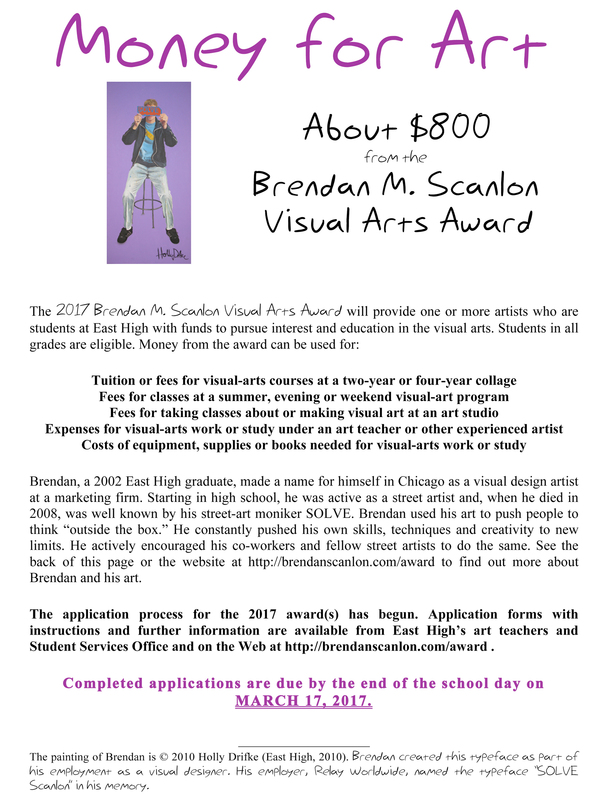 With generous contributions from family members, friends, colleagues, teachers, acquaintances, employers, and fans of SOLVE, his parents and sisters established the Brendan McGlynn Scanlon Memorial Visual Arts Award Fund at the Foundation for Madison's Public Schools. Each year students at East High School who are artists are invited by SOLVE's family with the generous assistance of the School's art teachers to apply for an award from the Fund for a visual art project that will "push the artist creatively and push other people to think." For details about the 2017 award or applying for it, go to brendanscanlon.com/award. GREAT FOR YOURSELF! WONDERFUL AS GIFTS! Click for information on obtaining the 48-page Zine. Please send greetings, comments, questions, etc. to solvesfamily at solvelives dot com. for allowing SOLVE's family to have the "solvelives.com" domain name before its initial registration expired. The mural of SOLVE © 2008 Ben Bauman. This website © 2009, 2012, 2016 Eileen A. McGlynn and William J. Scanlon. The likeness of SOLVE is property of Eileen A. McGlynn and William J. Scanlon. "SOLVE" is a trademark of Eileen A. McGlynn and William J. Scanlon. Last updated 20 December 2016.